MILPITAS, CALIFORNIA – Families now have more choices for their children’s K-12 education. With modern technologies and globalization, school choice options include traditional public schools, public charter schools, public magnet schools, private schools, online learning, and homeschooling. 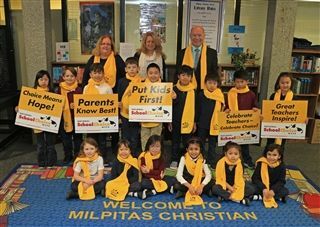 This week Milpitas Christian School will celebrate students, parents, teachers, and staff during National School Choice Week (January 20-26, 2019). MILPITAS, CALIFORNIA – Families now have more choices for their children’s K-8 education. With modern technologies and globalization, school choice options include traditional public schools, public charter schools, public magnet schools, private schools, online learning, and homeschooling. This week Milpitas Christian School will celebrate students, parents, teachers, and staff during National School Choice Week (January 20-26, 2019). MCS was also awarded honors for Day Care, Teacher (Lindon Richards), Principal/Director for Private School (Robyn Ritsema) and Things That Happened in Milpitas in 2018 (“Race for Education”). NSCW celebrates traditional public schools, public charter schools, public magnet schools, private schools, online academies, and homeschooling. For more information about NSCW, visit www.schoolchoiceweek.com. 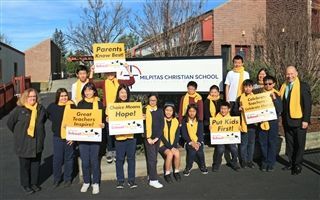 Founded in 1974, Milpitas Christian School (MCS) seeks to transform lives for Christ through excellence in education, relationships and service. MCS offers education to preschool, elementary and middle school students. MCS accepts students of all races and nationalities and does not discriminate in any of its programs based on gender, race, or national origin. For more information or to arrange a campus tour, visit www.MilpitasChristian.org or call (408) 945-6530.